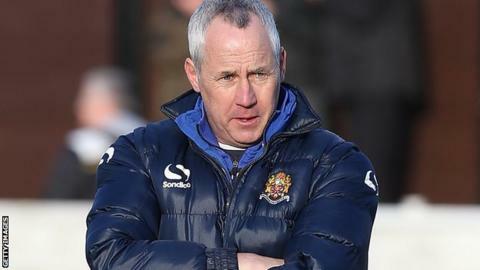 Dagenham have added Ian Culverhouse to their coaching staff after Warren Hackett left the League Two club. Hackett had been with the Daggers since 2009, initially working in the academy and then moving to a more senior role under then-boss Wayne Burnett in 2014. Ex-Norwich defender Culverhouse, 58, has spent time coaching at Colchester, Norwich City and Aston Villa. "Ian's a respected coach and he can improve the coaching set-up," Daggers boss John Still told the club website. "I believe he'll turn out to be a very valuable member of staff for this club." Still added it was the "right time" for Hackett to leave as he re-organised the coaching staff. "Warren put his heart and soul into what he was doing," he said. "In football we all have certain ways of working and I just felt like the combination I now have is possibly the right combination for the club." Watch: Ice Cube and Kevin Hart - the best football predictions ever? Read more on Watch: Ice Cube and Kevin Hart - the best football predictions ever?